We all goof up. It’s what we do afterward that’s important. The details behind exactly what Glenbard East’s Kenny Adams did to draw a disciplinary expulsion that day between football and basketball seasons his junior year in 2016 aren’t all that crucial. First of all, teachers and administrators can’t discuss such matters. Bottom line, it was a silly mistake. “At the time when I found out that I was going to be expelled I was just devastated. I just felt like I let my team down, my family, because they expected so much out of me. I knew that I messed up,” said Adams, a two-sport star. “I think it was something to learn from, definitely,” he said. That right there is key. In a win-win-win for the student-athlete, Glenbard East and District 87, Adams did what needed to be done to get back through the doors and into play. By sending him to Ombudsman Educational Services in Downers Grove, the school provided the mechanism for him to return instead of letting him twist in the wind. “I’ve worked in other high schools before and it’s not always the case after an expulsion that you have the opportunity to come back,” said D’Wayne Bates, in his third year as Glenbard East athletic director after working in the same position at LaSalle-Peru. The former Northwestern and NFL receiver started as a teacher and assistant athletic director at Evanston. Adams, who lives in Glendale Heights with parents Olivia Adams and Mario Tillman, twin sister Toraya and 5-year-old brother Mario Jr., attended Ombudsman from 10 a.m.-1 p.m. weekdays, taking the same classes he did at Glenbard East. Earning As and Bs, he said, at the end of his four-month stint Ombudsman presented him with a certificate he gave to the school for reinstatement. To occupy his time out of school, Adams worked out at the Glendale Heights Sports Hub and would then often practice with his travel basketball team, F3 Hoops. Hoping to play college basketball, Adams said candidly that his main motivation was returning to Rams athletics. He had help along the way. Not allowed on the Lombard campus during the expulsion, periodically Adams would meet elsewhere with Glenbard East principal Shahe Bagdasarian (“good, positive energy,” Adams said) and boys basketball coach Scott Miller to monitor his progress. 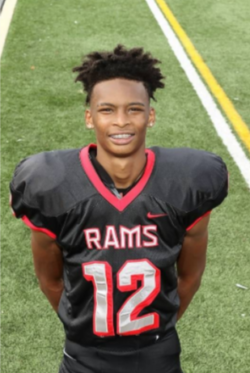 Glenbard East football coach John Walters — who noted Adams pulled more consistent grades this fall than as a junior — said it helped that Adams had no history of negative behavior. Walters described him as generally quiet though quick to smile and laugh. Opponents weren’t laughing this fall. The Daily Herald DuPage County All-Area wideout caught 54 passes for 836 yards while setting program records in both categories. Walters nominated him for offensive MVP in the Upstate Eight Conference Valley Division. In basketball Miller had him up as a sophomore, sixth man on a team that tied for first in the UEC Valley. This season the unselfish, super-quick guard is averaging 11 points, 5.5 assists and 4 rebounds. He doubles as a defensive stopper with 1.5 steals a game. Living and learning, he has. On Tuesday a pair of College Conference of Illinois-Wisconsin men’s basketball teams earned significant victories. Connor Raridon’s 36 points in a 92-78 home win over Albion helped his father, Cardinals coach Todd Raridon, win his 500th game. That makes Todd Raridon one of 13 active Division III coaches with at least 500 wins. He ranks 45th in college basketball history in victories among coaches with at least 10 years of Division III experience. In Spokane, Washington, Wheaton College beat Whitworth University 92-84. That snapped No. 7 Whitworth’s 30-game, regular-season winning streak against nonconference opponents, the longest in Division III. It was the Thunder’s first road win over a top-25 foe since beating No. 17 University of Chicago on Dec. 3, 2014. Not a lot of colleges would have cleared that title. The Falcons ran the ball nearly exclusively during their 1979 Class 4A championship run with Long at quarterback, and despite consecutive all-state honors his offers were few. Long accepted Iowa’s one remaining football scholarship. He became an All-American, finishing second to Bo Jackson in 1985 Heisman Trophy voting and winning the Maxwell and Davey O’Brien awards. Detroit’s first-round draft pick in 1986, he spent three of six NFL seasons as the Lions’ starting quarterback. Long then entered the coaching ranks as an assistant with Iowa and Oklahoma before taking the San Diego State head coach job for three seasons. He now provides football commentary and analysis for the Big Ten Network and is CEO and executive director of the Iowa Sports Foundation. We couldn’t attend Long’s presentations at Wheaton North, but our pal Jeff Potter did. The Falcons’ assistant boys cross country coach and boys track distance coach teaches poetry and creative writing there. Along with Long covering his background as a three-sport star at Wheaton North, Potter said a big thrust was overcoming adversity and adapting to change every step of the way — from junior high to high school, to college and the pros, to college coaching, even to getting fired by San Diego State. “Kind of all adversity makes you stronger,” Potter said. Now, Falcons assistant coach Paul Connor won’t make any promises, but he tries to help coaches develop all players through his annual football clinics at the school. This year’s Falcon Football Clinic will be held 8 a.m.-noon Jan. 13, followed by a social at the Veterans of Foreign Wars Post 2164 in Wheaton. Connor’s speakers, always hand-picked, include: former Northern Illinois quarterback Jordan Lynch, now a Huskies’ assistant; Northwestern assistant Matt MacPherson; Oswego coach Brian Cooney; and Thomas Sitton, defensive coordinator at Judson High School in Converse, Texas. As a gift for the football coach who has everything, call Connor at (630) 697-4779 or reach him by email at Paul.connor@cusd200.org.